Having Fun First: 3, 2, 1.. Blast off! 3, 2, 1.. Blast off! 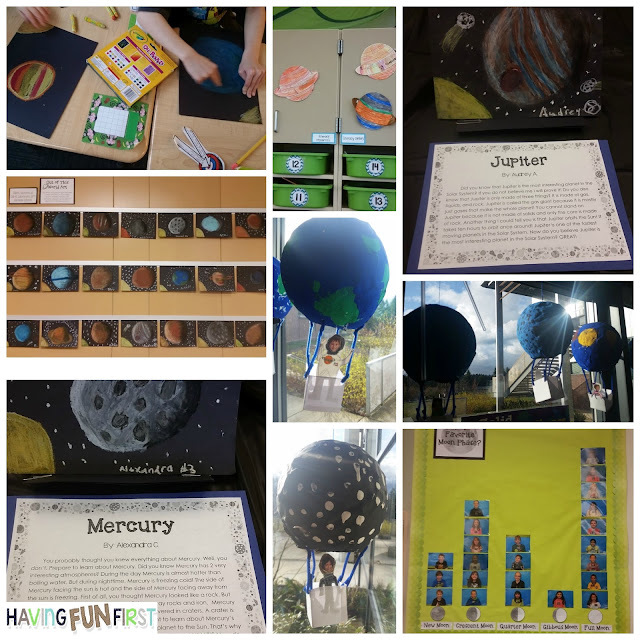 I was so excited when I transitioned to 2nd grade to get to study space. So excited that I created a fun unit this summer in anticipation. So we just finished up the unit in our room and boy was it a success! The kids absolutely loved learning about the different planets and other fun elements of the solar system. The kids reports, art and other fun activities turned out wonderfully and really impressed parents as the walked through our open house. I love offering open houses as a less formal and flexible option for the kids to show off their work. Check out these pics below of the kids work. I added an art project not included in the pack but would be more than happy to share the simple steps if you have interest. I posted a few fun pics that I snapped during the unit. Have a great night!